The SDC - Les Quartiers du Canal illuminates and embellishes, this year again, the Notre-Dame Street West with the installation of the original luminous decorations and a novelty for 2018. As night falls, Notre-Dame Street West unveils its assets to dazzle passers-by. Its architectural buildings, antique shops, small shops, independent cafés as well as its gourmet addresses form a beautiful setting for walkers who come to enjoy Christmas time as well as the winter season. On these bright structures, we find forks, knives, cocktail glasses, and circular shapes and flowers to remind the many shops in these neighborhoods. New for 2018: five new luminous circles have been added on Notre-Dame Street West between Guy Street and de la Montagne Street in the Griffintown neighborhood. 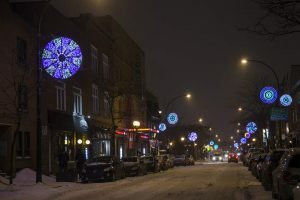 The route of the winter illuminations now extends over 1,7km (against 1,3km 2017), thus contributing to improve the experience of our residents, Montrealers and our visitors who take advantage of this main commercial street to shop and eat. 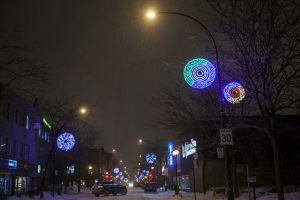 These illuminations, which have received the support of the borough of South-West of Montréal, contribute to the beautification of this commercial street until the end of the winter.